This course has been designed for local programme coordinators to meet local needs and is designed for health and other professionals who work to promote physical activity with older people (e.g. Health improvement managers in PCTs, development officers in local authority leisure and social services, non- governmental organisations, the residential and care sector, housing wardens and exercise and health co-ordinators). Further information on the course, duration of the course and resources can be found further down this page. For those who wish to take this work forward and develop a local programme within a local partnership but require a collective understanding and direction to their work. This course provides bespoke training for groups of local professionals and partnerships who feel that they need additional support in planning and implementing a Senior Peer Activity Motivator programme. – One full day training with group (experience suggests maximum of 20 participants). Training could be delivered by external trainer together with local trainer. Individual queries and discussions about tailoring a programme to meet your needs contact Bob Laventure via the LLT office. Experience suggests that this training is best delivered over two separate half days, but the material can be delivered in one day. This would involve a 9.30 start and a 4.00 finish. Follow up meetings (half day) can be provided and undertaken by local coordinator and local partner agencies as first step to developing support mechanisms for mentors and look at the progress of the programme. All participants will be provided with training resources for their own use with Senior Peer Activity Motivators. They will also receive the following resources for their own use. CD ROM for Local Coordinators which covers the 10 steps approach to the planning, organisation and evaluation of a local Senior Peer Activity Motivator programme. CD ROM of Senior Peer Activity Motivator training materials including powerpoints and volunteer mentor resource/handbook. The following resources will also be available to view at the course. Mentoring and Befriending Foundation (2007) A synthesis of published research on mentoring and befriending. Mentoring and Befriending Foundation, Manchester. Volunteer Development Scotland (2004) A Way of Life: Black and Minority Ethnic Communities as Volunteers’. Volunteering Scotland. Volunteering England (2004) Volunteering Impact Assessment Toolkit, Volunteering England, London. Fit as a Fiddle Programme for working with volunteers from AgeUK. “Someone Like Me!” is a national programme of training for health and other professionals who wish to deliver their own local training for senior Peer Mentors. The Someone Like Me programme was developed as a partnership between Later Life Training (LLT), the BHF National Centre for Physical Activity and Health (BHF NC) at Loughborough University and Age Concern, Ageing Well (now AgeUK). There is substantial evidence relating to the benefits of physical activity for the older person as a means of improving physical and psycho-social health, promoting independent living and well being. However, for many older people, physical activity is not an integral part of their lives. The aim of the Someone Like Me programme is to therefore increase opportunities for older people to become motivated towards and participate in health enhancing physical activity. Volunteer peer mentoring is a well established mechanism for engaging older people in health promotion programmes. The Someone Like Me Programme can be used by a range of agencies as a means of initiating physical activity among older adults and provide a “strategic fit” to local health and activity promotion programmes which target older adults. We have compiled a list of frequently asked questions about the programme, Click here to download. *Our thanks also go to: The organisers and participants of the Senior Peer Activity Motivator pilot courses held in Dudley, Eastbourne, Kirklees, Liverpool, Sutton, Wigan and Woking and the participants in the pilot regional training event in Preston. What is a Senior Peer Activity Motivator? Someone who will help their peer group overcome some of the barriers to physical activity that older people face and move into or step up their campaign for healthy living and successful and active ageing. are a positive role model. 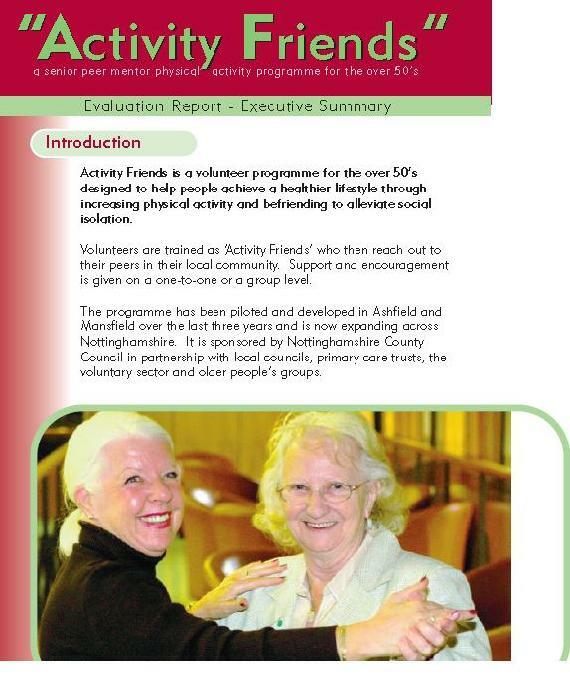 Senior Peer Activity Motivators can be used in a number of situations to engage, motivate, buddy and support people into physical activity programmes and have been used in falls prevention, mental health, befriending and active living programmes. However, they are not trained to, nor are they expected to give medical advice or lead/teach exercise and physical activity programmes. The following guiding principles represent the values, beliefs and philosophical underpinning of older people’s beliefs about an active way of life that underpin the Someone Like Me programme. Older people should be placed at the centre of development and these principles should underpin the promotion of physical activity. It is recognised that physical activity is essential for daily living and a cornerstone of health and quality of life. There is a need for more positive attitudes towards ageing, with realistic images that depict older people as respected, valued and physically active members of society. Older people should be encouraged to participate in decision-making and leadership positions, in all phases of programme planning, service development and delivery. Through co-ordination, collaboration, consistent messages, and appropriate programme planning, physical activity may have a significant impact on society and lead to positive long term change. The issues, interests and needs of older people in their community must be identified, and accessible, affordable activities and programmes must be designed to meet these needs. While it is recognised that ageing and learning are both lifelong processes, it is appreciated that, for some, pre-retirement may be a key time to focus on physical activity and well-being. Society should be a society for all ages. 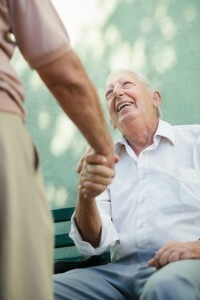 It is therefore necessary to develop programmes and services which accommodate older people’s choices to be with others. There is a need for education on and promotion of the health benefits of physical activity as a way of life for both older people and those who work with them. Senior Peer Activity Motivators are not expected to give medical advice. Training for Senior Peer Activity Motivators does not entail the leading of exercise classes or groups, although in many cases that is what Senior Peer Activity Motivators may go on to do following further training. A job description for a volunteer Senior Peer Activity Motivator can be downloaded from here and a further document on their role, downloaded from here. There are two seminal papers, one on volunteering and health and one on the role of mentors in falls prevention that you can download direct. An abstract on the LLT Peer Mentor Programme can be downloaded by clicking here. Someone Like Me – Is it effective, does it work ? There is growing evidence that such programmes can be very effective in helping older people to make decisions about their own health and become more physically active. There is also evidence of the benefits to those involved in volunteering and mentoring.There are two seminal papers, one on volunteering and health and one on the role of mentors in falls prevention that you can download direct. An abstract on the LLT Peer Mentor Programme can be downloaded by clicking here.Local programmes will identify their own criteria for success and there is detailed advice on evaluating local programmes included in our resources and training activities. The examples included below indicate both the nature of evidence that can be collected about successful programmes as well as the way in which programmes can be used to target different groups of older people. Over the past 15 years we have had feedback from those we have trained and held stakeholder consultations and have produced further information on Key Lessons learned – how to make a real success of your mentoring scheme. The BHF National Centre for Physical Activity and Health at Loughborough University and the ActiveAge Unit, Age Concern England undertook an assessment of the impact of the Someone Like Me programme. They identified top 10 key areas of learning from programmes currently involved in the “Someone Like Me” Programme. They are seen as essential to the successful planning of any local programme. There is no formal assessment of these courses other than in-course review and evaluation of the extent to which courses have achieved their stated learning objectives. Certificates of Attendance, detailing content hours, course content and date for evidence of CPD and training are provided by LLT. LLT will provide Bespoke Someone Like Me Training for a host organisation for £1,200 (+ VAT) per day. There is a maximum of 20 participants on a single day and some course resources must be printed by the host organisation. All resources will be provided on a CD ROM. Additional half-day pre and post course support: £600 (+ VAT) per half day. If you are interested in hosting a Someone Like Me course in your local area, please contact Bob Laventure through the LLT Office. We encourage everyone to be responsible for their own learning. In light of this, we ask that you please inform us, at point of application, about any learning support requirements and/or medical conditions support that will help your course candidates to access our course content and learn effectively. All information will be treated confidentially and we will make reasonable adjustments to meet their needs.